Sometimes, reading ‘The Walking Dead’ is a bitter-sweet experience. You can gallop through an issue – an issue you have been waiting roughly 4 to 6 weeks for – in around 10 minutes. With issue #58, I felt as if I had read 2 issues in 1. 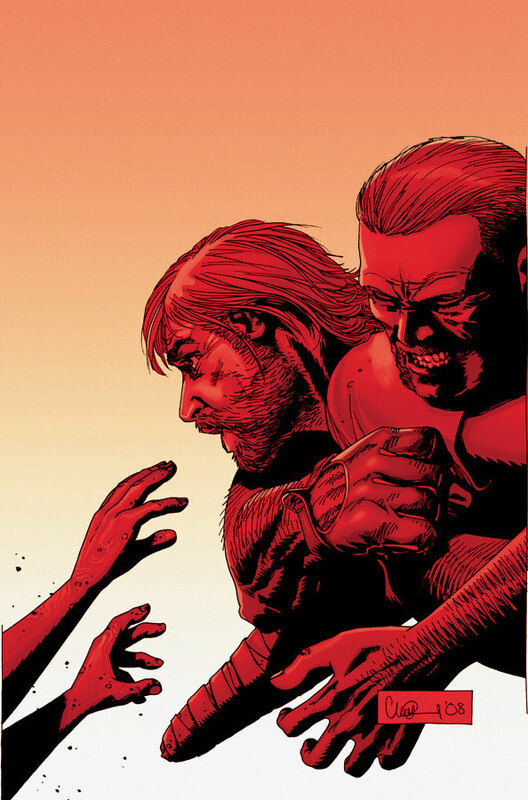 This time around Robert Kirkman has packed in so much drama, incident and plot developments that it does feel like a super-size edition. Believe me when I say there is no drop in quality either. Essentially this is a comic book in 3 acts. The first part deals with the tense relationship between Abraham and Rick, and what seems to be a resolving of their differences in their often tense encounters. As they both discuss what they have had to do to survive, and what they have been prepared to do in order to protect their own interests for the sake of their loved ones, you see the two of them finally come together as equals. This could be a big turning point in the story for Abraham Ford – is Kirkman moving him centre stage as a good guy and Ricks ally? Just when you think that this issue is going to be taken up with the exploration of Rick and Abraham’s characters, a second act begins as we cut to some of the group back at their temporary base. There are cracks beginning to show in the solidarity of the recently reunited group, with Dale wanting to break free with Andrea and some of the children. He is concerned with Rick, and what he perceives as a change in his character, a change for the worse that leaves Dale scared. Andrea, however, remains unconvinced. There is even time for a brief discussion on the Mullet hairstyle that involves Dr. Eugene Porter. At face value this looks like a brief and humorous interlude, but when it is Andrea asking the question, who along with Michonne are 2 of the most capable and strong characters in this series, then maybe that is a hint that Dr Porter is not all he seems. Maybe. Finally, in the third act, we are finally reunited with Morgan Jones, who along with his young son Duane, were the first living people Rick encountered in The Walking Dead after the Zombie outbreak. Their meeting starts off badly and gets worse. I will say no more other than this ties in brilliantly with the exploration of what it is to be a man and a father in the wretched world that Rick, Abraham and Morgan inhabit. The ending is moving and surprising. No big cliffhanger this time – just pure Robert Kirkman class. Kirkman is essentially asking a big question throughout this issue. That question is, as I understand it, ‘how far would you go to protect / avenge your own?’. This follows on from last issues encounter with the 3 bandits and Ricks response, and is expanded on in acts 1 and 3 of this issue. The writing is understated or believable, and you understand the conviction of each character. Finally, let me just pay some attention to Charlie Adlards art which is superb as ever – particularly on the change of appearance in Morgan since the last time we saw him. No matter how many times I say it, it doesn’t diminish the fact one bit – The Walking Dead IS the best comic book around, and Robert Kirkman, Charlie Adlard and Cliff Rathburn make an amazing creative team.